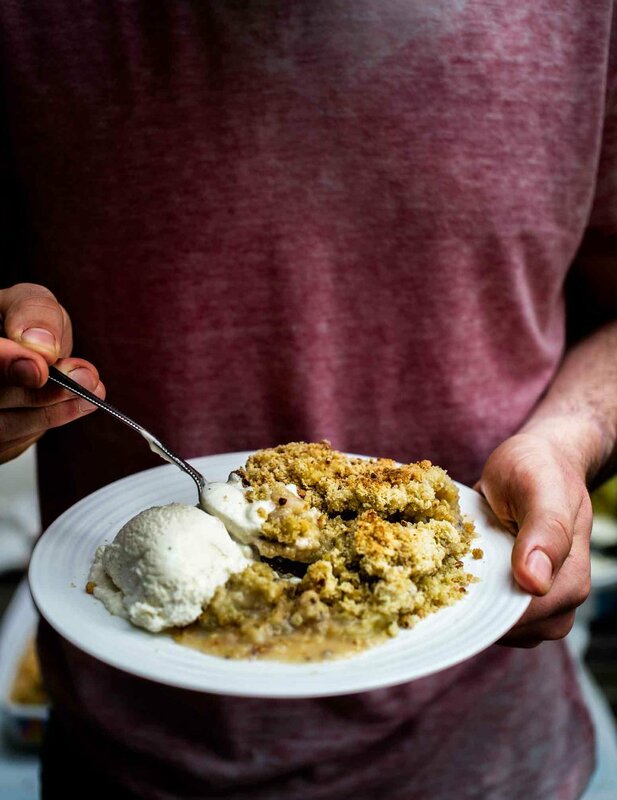 But if I were stranded on a desert island and could only have one dessert for the rest of my life, it would be a fruit crumble. Oh, and to my US readers, I’m almost certain a crumble is what you refer to as a ‘crisp’. 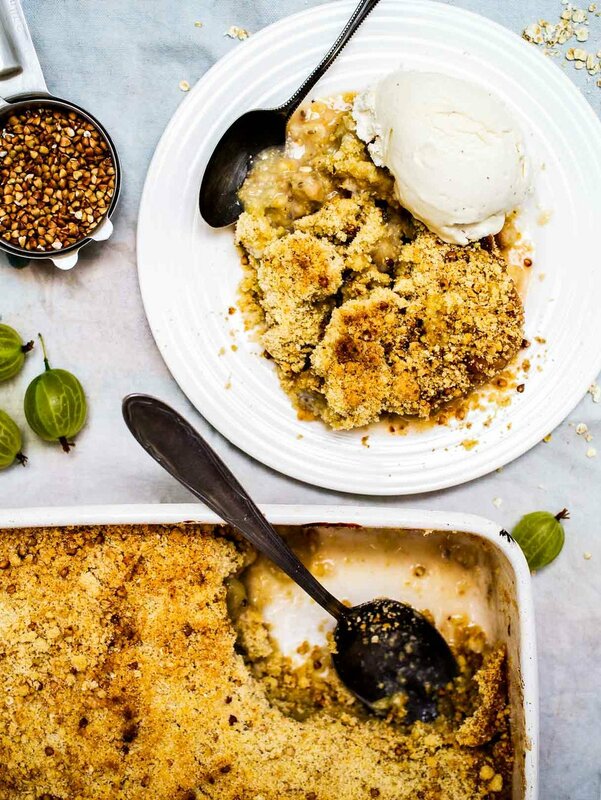 You can make a crumble from most fruits. Apple, blackberry, plum, peach and pear – all delicious. However, the best crumbles are made from sharp fruits, which can handle more sweetness, like blackberries, rhubarb and – what are we here for?! – gooseberries. Gooseberries, also known informally as goosegogs (don’t ask – I tried and got nowhere), are a relatively rare berry. They’re only in season in the UK for a few weeks in July. I rather like that they’re only around for that brief period. It’s as if someone has taken the difficult decision of what ingredient to cook with for you. As so many fruits and vegetables are available all year round now, it’s nice to have a time-based imperative to use a seasonal one. 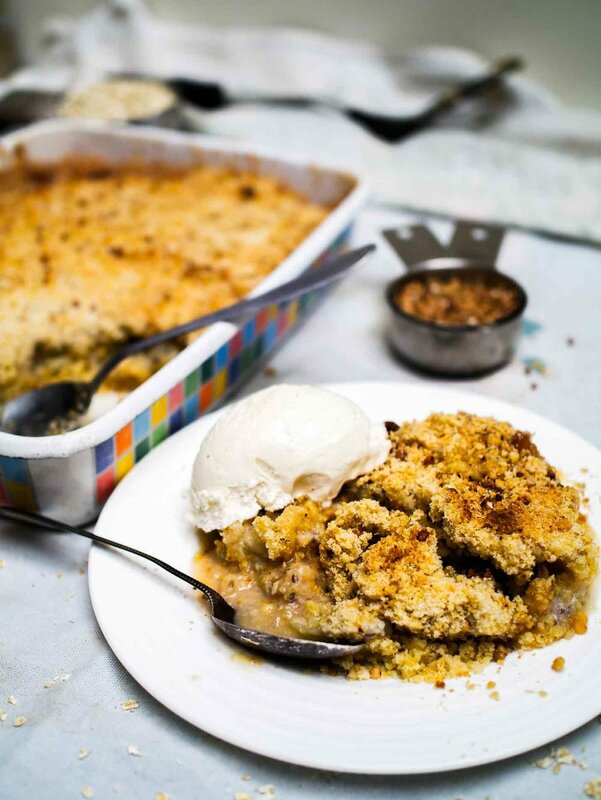 I did a few experiments to find the perfect crumble topping and the results were clear-cut. Wholewheat flour was too heavy and baking powder didn’t make a difference. Hazelnuts were good but unnecessary. Rolled oats added a nice visual contrast but the standout addition was buckwheat groats. Their nubbliness adds a nice textural contrast much like nuts, but aren’t as overpowering. I’ve made the buckwheat optional, though, because I didn’t want to add too many obscure ingredients. Ground almonds (aka almond flour) went superbly with the gooseberries so I’ve used nearly equal proportions of them to plain flour. I like to eat this with ice cream, custard or squirty cream, for all of which you can now get very good vegan alternatives. Top and tail the gooseberries with a small sharp knife (if you've never done this before it means cut off the stalk and 'tail' bit). Put the flour, ground almonds, salt and vegan butter in a food processor. Pulse until the mixture resembles large breadcrumbs but stop before it clumps together. If you don't have a food processor, rub the butter into the flour and almonds with your fingers in a large mixing bowl. Preheat the oven to 175°C/350°F. Add the oats to the food processor and pulse a couple times. If you're not using the buckwheat, add 35g/1oz/⅓ cup more oats and pulse once more. Transfer the mixture to a large mixing bowl and stir in the sugar and the buckwheat if using. The mixture shouldn't stick to your hands too much. If it does, add more flour or ground almonds. Put all the gooseberries in a 28cm/11" long by 22cm/9" wide by 5cm/2" deep oven-proof baking dish and sprinkle over the sugar. You could use a deeper, less wide/long dish if you like. 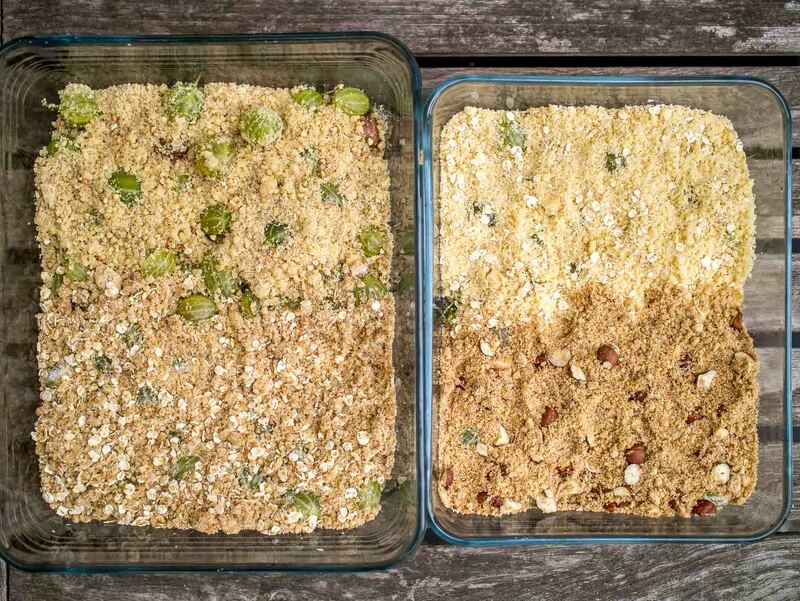 Spread the crumble mix evenly on top of the gooseberries and pat it down gently. Don't worry if it heaps above the top of the baking dish - the gooseberries will shrink down in the oven. If it does heap above the rim, put a baking tray on the oven shelf in case any juices spill over. Bake the crumble for about 45-50 minutes until golden brown. Check after 20, 30 and 40 minutes to make sure it's not burning. If it is, cover with aluminium foil. Remove from the oven and allow to cool for at least 20 minutes. Serve in bowls or on small plates. I like to eat this with vegan ice cream or vegan custard.